BLOWIN’ AT THE ROCCO: Saturday Night is an experimental interactive work that seeks to exploit and enhance the creative potentials of digitally produced music, sound, image and text relationships in an interactive online Broadband environment. In this context, the delivery of interactive work online provides an innovative approach to the conventional narrative & documentary forms. In BLOWIN’ AT THE ROCCO: Saturday Night, the participant/player will experience new possibilities produced through the slippage across a series of interactive screen surfaces, engaging the participant/player in a spatial relationship with the program. The participant/player discovers the origins of Sydney Jazz milieu through the eyes of Serge Ermoll Jr. (Jazz Pianist/ Private Investigator) during, smoky sophisticated bohemian, Sydney circa 1968. In addition the user is revealed eight tracks of original Australian jazz, recorded live at the El Rocco Jazz Cellar, 1968. Serge Ermoll Jr (Sergei Ermollaeff) owns the copyright on all original compositions and recordings of his music. The production Budget would incorporate research fees and broadcast fees for the use of all other archival image, sound, text materials. 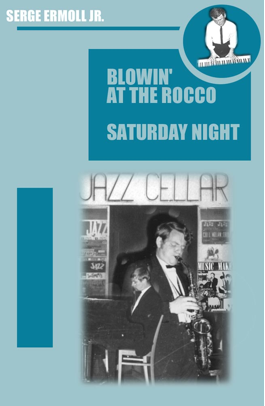 BLOWIN’ AT THE ROCCO: Saturday Night is composed of eight storylines, a series of interactive immersive screen environments, characterising the narrative structure of the program. The pathways are named by eight musical movements recorded by Serge Ermoll Jr (Sergei Ermollaeff). The recurrence of musical allusion and composition (a) in the form of musical iconography and (b) in the rendering of musical score in sonic fragments – will resolve in each storyline as the realisation of these eight jazz tracks. From the surface of the computer screen each story unfolds inside a series of frames, inspired by (Black American) Blue Note modern jazz album covers and early Russian constructivist assemblages. The jazz tracks name each storyline expressively, evoking the emotive state of the compositions and shaping the narrative structure of the pathways. This story conjures the memories of the musicians, music entrepreneurs, and patrons. The pathway is inspired by written texts by Bruce Johnson, John Clare, Kenneth Slessor, statements by jazz musicians remembering the milieu, and news stories reporting on the phenomena of the jazz cellar. This story explores the FREE KATA jazz ensemble of the 1970s, evolving from the seeds of El Rocco jazz culture. This pathway is composed of photographic portraits of the musicians, album artwork, record labels, music publicity material, text from news article coverage of the ensemble, and locates the music in the context of images of urban Sydney in this period and references the larger jazz picture. This storyline contextualises Australian Jazz & the era in archival moments that iconicise the sixties and world events shaping the Australian spirit: (i) the anti-Vietnam war protests (ii) the assassination of Martin Luther King Jr, (iii) Robert Kennedy’s campaign against Lyndon Johnson and the Vietnam war. The imagery evokes the generational complexity & tension that produced the fresh and vital early Australian jazz. This pathway is composed of original photographs, digital reconstructions, news articles, archival photographs, digitized moving image and sound. This story evokes Sydney circa 1968, and juxtaposes the Eastern seaboard city with imagery of the Australian red center, (white tourists) a family visit to Uluru in a light plane, in the context of political movements (the anti-Vietnam war protests – students) and populist imagery – Shrimpton wears the legendary mini-skirt. This pathway is composed of original photographs, digital reconstructions, news articles, archival photographs, digitized moving image and sound. This story is personal and exposes in a series of black & white photographs and interviews two immigrant Australians broadening their horizons and making the journey back to Europe. This story charts the movement of Serge Ermoll’s forbearer’s diaspora from Russia in revolution through to Harbin, Manchuria and then international capital of the East – Shanghai, China where his father worked as a jazz bandleader. Serge and his Russian parents then immigrate to Australia with assistance from the International Refugee Organisation. Serge Jr reflects on the influence of his China born father on his contemporary jazz endeavors in Australia. This pathway is composed of dramatized interviews/statements & original photographs. This story envisions Kings Cross and Sydney, 1968. The participant/player enters into the space of clubs and strip joints, café culture at night. The participant/player is provoked to uncover a criminal situation, revealed through the character of the detective (Serge Ermoll Jr/ jazz pianist) in a series of reconstructed & simulated photographic & filmic sequences that expose Sydney’s underworld.